Locking / sliding T-2 focusor (for 1.25 Inch eyepieces / 10mm focus travel). This very handy T-2 accessory has two main purposes. Firstly it is a variable length T-thread adapter. 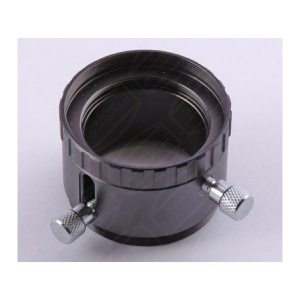 Secondly it can be used as a T-threaded, 1.25" eyepiece holder. The adapter comes in two parts, the first outer part can only be used with the second, this way it functions as described above, a variable length T adapter which can be set between 31.5mm and 42.5mm, there is a thumb screw to clamp down at your desired length. The inner part has a T-thread on one side and a 1.25" eyepiece holder and as such it can be used as a simple holder as such. Focus can be varied by manually sliding the focuser into place and locking.